ATRA will host the 2019 ATRA Annual Conference in Reno, Nevada at the Peppermill Resort Spa and Casino, September 14 - 17, 2019. The conference theme is "Energize and Innovate in Recreational Therapy." The conference is an excellent opportunity for recreational therapists, students, educators, and allied health care professionals to promote the advancement of the practice of recreational therapy. All proposals are due on March 30, 2019 at 11:59p. Speakers will be notified mid-May. Educational sessions are presented in individual concurrent time slots, selected from proposals submitted in response to this Call for Presentations by a blind peer review (anonymous author). Session time slots are typically 90 minutes, with occasional 180 minute sessions available. Full (6 hours) or half day (3 hour) pre-conference intensives are also accepted. Speakers who are accepted for presentation will be offered a partial waiver of conference registration. Waivers are awarded on the basis of session length and the number of presenters for each session. A signed speaker agreement and Form W9 are required in order to receive a waiver. ATRA is not required to issue a 1099 to anyone who does not receive at least $600 in services, products or benefits in a calendar year. Speakers may choose not to use the waiver in which case no Form W9 is needed. Speakers will pay for their own meals, lodging, transportation, CEUs, handouts and registration fees (minus the waiver). Practitioners, students, and educations are also invited to submit research abstracts and posters for the 2019 Research Institute, held during the ATRA conference. Proposals and cover letters for the Research Institute are due March 30, 2019 at 11:59p. Proposals for Oral Presentations should represent completed research projects, or research with enough waves of analyzed data to confidently present current significance of findings and anticipated trajectories. Proposals for the Poster Sessions can be submitted in one of three categories: (1) Research; (2) Research to Practice; or (3) Practice. Content of all proposals must be applicable to recreational therapy practice. All proposals should include a section header dedicated to implications for recreational therapy practice. Speaker discounts will be awarded to first authors of all proposals accepted to the Research Institute. All proposals must be submitted through Proposal Space at the following link: https://proposalspace.com/calls/d/986. If you are submitting multiple proposals (in the same or separate categories), please be sure that the findings are distinct enough to warrant separate submissions. You must complete a new submission through Proposal Space for each presentation and/or poster you would like to be reviewed. You may not submit the same proposal to be considered as a presentation and a poster. You should only submit a proposal if you, or one of the authors, is planning to attend the ATRA conference to present your findings. Late submissions will not be accepted unless ATRA extends the deadline for everyone. Proposals that do not include a cover page and/or are not formatted correctly (see requirements below and on submission cover page) will not be reviewed. Oral Presentation and Poster Proposals may not exceed one-page of text (Times New Roman, 12 pt font, single spaced, 1” margins), excluding Tables and References. Tables and Figures may not exceed one-page in length. A title (left justified and bold) should appear at the top of the page. Author name(s), credentials, and affiliations should appear on a single line, immediately following the title. Oral presentation proposals must use standard abstract headers (e.g., Introduction, Methods, Results). Poster proposals must use abstract headers reflective of the criteria required of the poster category you are submitting to (e.g., Intro, Methods, Results should be used for Research posters; Program overview, Program goals, Assessment should be used for Practice posters). Note: A cover page will be required and should be submitted with your proposal. Please log in to Proposal Space for more information about what this involves. APA (6th ed.) format is required of all proposals, including citations, references, tables and figures. Proposals that do not include a cover page and/or are not formatted correctly will not be reviewed. Questions about the Research Institute should be directed to:researchinstitute@atra-online.com . If you are interested in participating in the item writing process, please fill out the Item Writing Application and email to nmolloy@nctrc.org. Applications should be submitted to NCTRC no later than February 22, 2019. Item writers will be notified via email if they have been selected for inclusion in this project. A mandatory Item writing training will take place via conference call on March 1, 2019 from 12pm–2pm EST, with the item writing to be completed and submitted no later than April 5, 2019. Each of the selected item writers will be required to submit a minimum of 10 items related to assigned exam content areas. If you have any questions, please feel free to contact Noelle Molloy at nmolloy@nctrc.org. 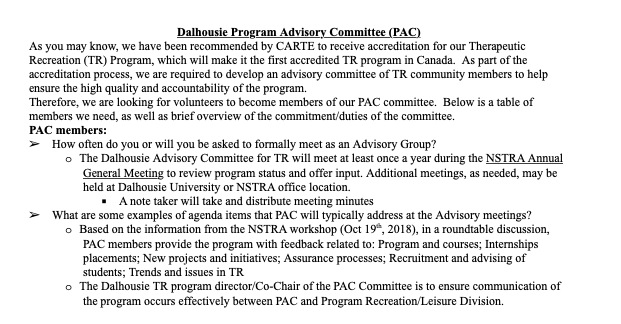 DAL CARTE ACCREDITATION: TR ADVISORY COMMITTEE RECRUITMENT! For individuals collecting CEUS, SMART CEUs Hub offers 100% access to the entire course library which includes any new additions throughout the year. Membership to SMART CEUsHub is all inclusive, which means no additional costs or fees or additional requirements are needed. "To provide quality, affordable, and relevant continuing education courses that will equip Recreational Therapists in the workplace." "To provide a venue for Recreational Therapists to teach other Recreational Therapists while earning extra cash on the side. This is done through our 'SMART Instructor' program." Background The purpose of this research was to examine effects of a therapeutic recreation (TR) program designed to increase executive function (EF), social skills, adaptive behaviours and well-being of adults with autism spectrum disorder (ASD) and intellectual disability (ID). Method A preliminary pre-test, post-test randomized control group experimental design was used to measure effects of a 40-week TR program designed to increase EF (TR-EF). The TR-EF used instructional electronically based games delivered during 200 1-h sessions (5/week). Results Participants (experimental group, n=19; wait-list group, n=18) were evaluated at baseline and 10months later. There was a positive and direct impact of the program on several EF and indirect effect on social skills, adaptive behaviour and personal well-being. Conclusions Findings provide support for inclusion of EF enrichment as a way to enhance effects of TR interventions for adults with ASD and ID. Preliminary results of this study can be considered in planning TR services in the future. In addition to TREF program primary effects on EF, there were indirect beneﬁts on adaptive behaviours, personal well-being and social skills.